Something a little different for you today on the blog, in the form of vintage pjs in my natural habitat... I've been lusting after the Burda Style 7109 sleepwear pattern for quite some time and I finally picked it up last month during the summer sewing pattern sales. 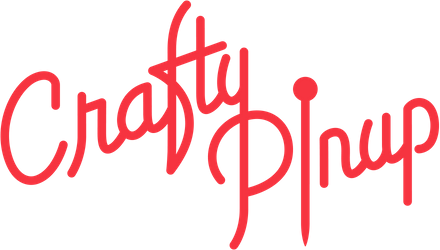 If you weren't already aware, I have my own business My Retro Closet, a vintage inspired lingerie and nightwear store where I design and sew lots of babydolls and other delights inspired by the 1950s and 1960s. So any retro style pjs or lingerie patterns I spy online I like to snap up for inspiration and personal use. The 7109 pattern appealed to me on so many levels! I opted to sew the babydoll style top (pattern: C) with the matching shorts (pattern: D). Between the pattern arriving on my doorstep and having a finished set of pjs, it took about 24 hours! It was during a point in my week where I was stressed out with work and feeling a bit overloaded. So I indulged in some self care in the form of sewing myself some quick, cute and comfy pjs. The 7109 pattern came at the perfect time! I rummaged through my fabric stash and found some gorgeous leopard print polycotton I had left over from a previous project, which lended itself perfectly to pjs. You might notice I've tweaked parts of the original pattern. Instead of the recommended lace neck frill, I opted to create ruffles out of my fabric and instead of binding the neckline as instructed in the pattern, I used some satin binding and turned it into a style feature. I just love leopard print and baby pink! For the shorts I used the 7109 pattern but I opted not to create the 'bloomer' effect with elasticated legs. I think for my figure it wouldn't be very flattering and I find the free fitting legs far more comfortable and modern. I made no changes to the pattern pieces, elasticated the waist as instructed, but for the leg hems I added more ruffles and topstitched them, to create cute frilly legs! Notions: Satin binding, mini satin bow, wide waist elastic. Sewing time: A hour or two! Difficulty: Nice and easy, especially with my added style changes. 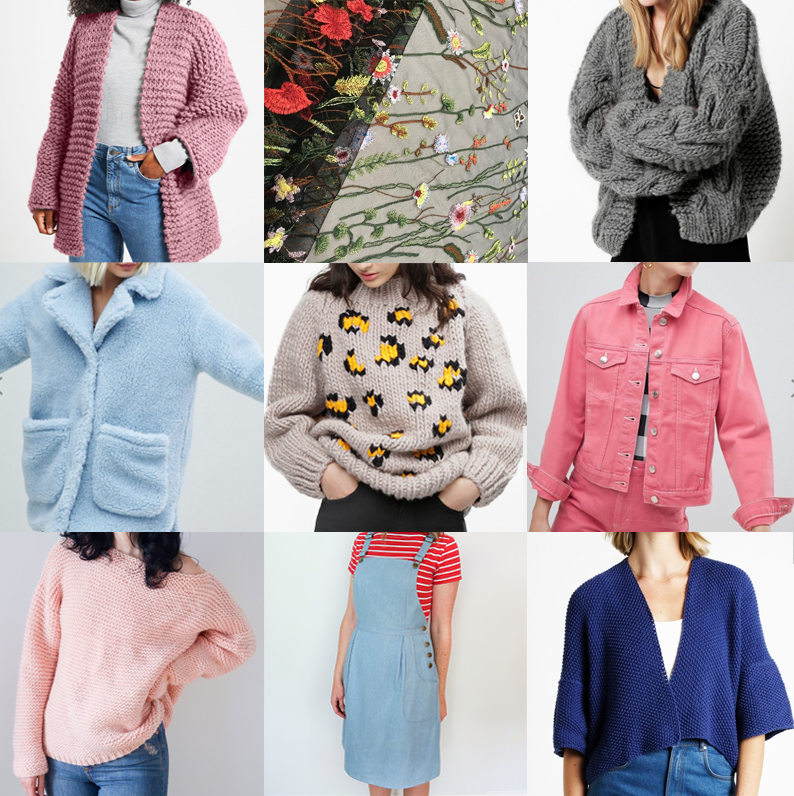 Watch out for: Getting even frills. Make Again? : Yes! I see many more of this style in my future! 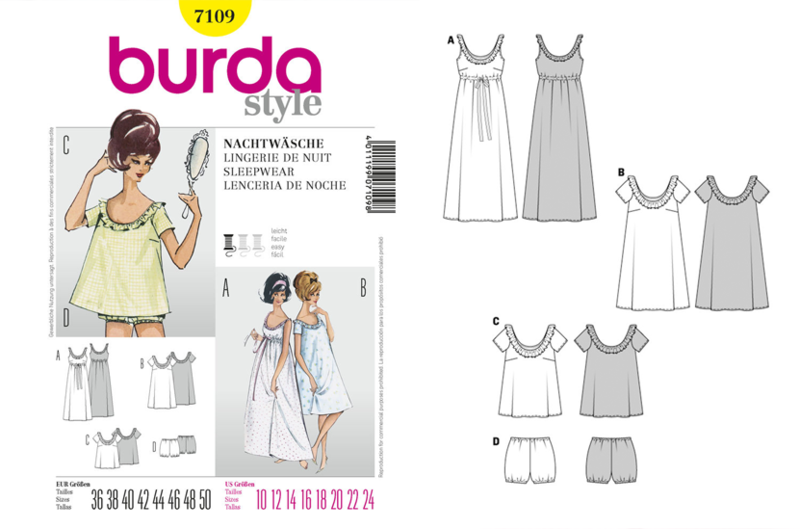 Overall, the Burda 7109 pattern has gone straight to the top of my favourite sewing patterns. I've been living in the shorts for comfy summer evenings and the full set just feels so nice to wear and ticks all the boxes for me. It's practical and pretty and makes me happy! 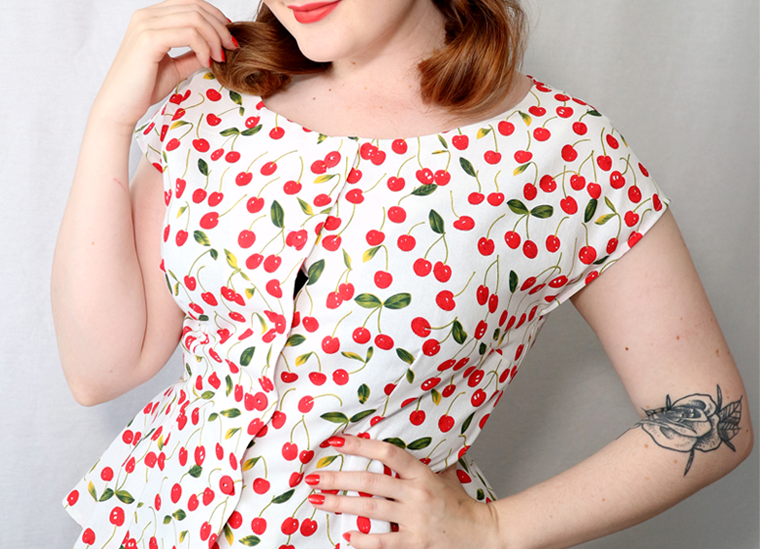 So if you're a lover of retro style or just super comfy pjs, this pattern is for you. Will you be trying the 7109 pattern? What's your favourite nightwear sewing pattern? Like June, I also had a wedding in July, but this time around the wedding was more casual and took place in a beautiful farm setting. 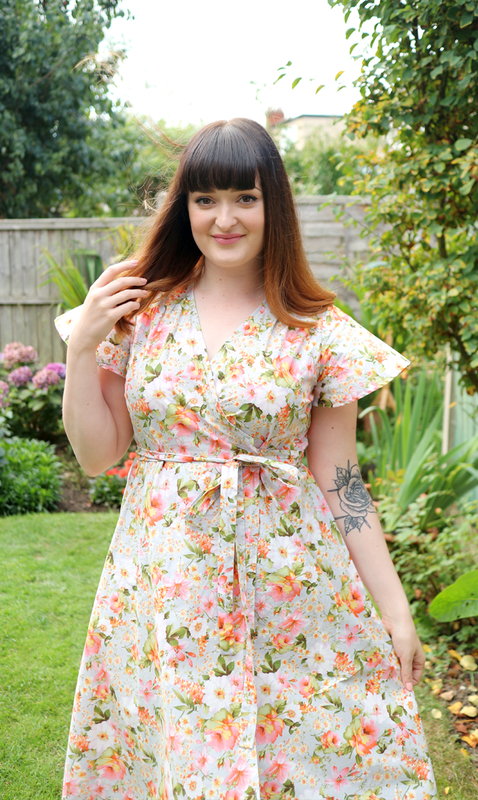 I thought this would be the perfect opportunity to try out the new Sew Over It Eve wrap dress! Notions: Satin ribbon/stay tape for the neck edge. Difficulty: I found finishing the centre front seams a little tricky, but otherwise straight forward. Watch out for: Getting a tidy neck edge! Make Again? : Yes! I think this is a great pattern and a flattering style. 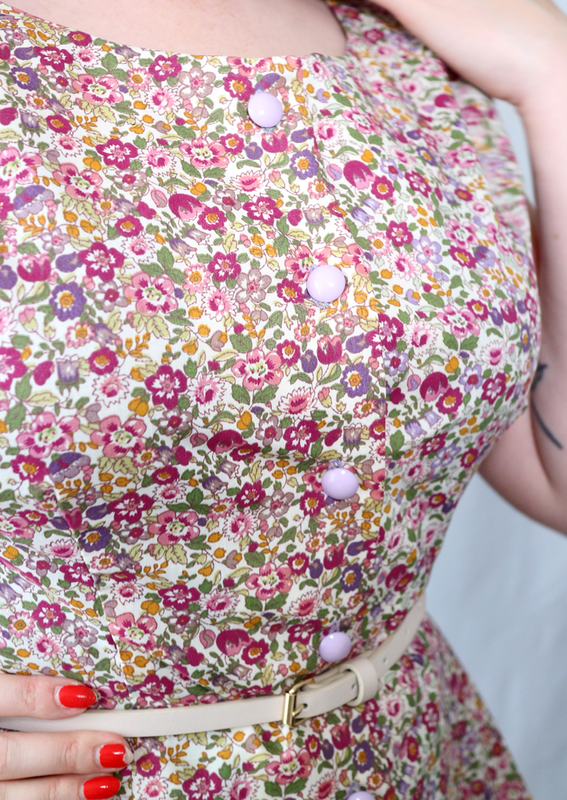 You can see more of this dress in action in my July Sew & Tell YouTube video HERE. See Everything I Made in July! 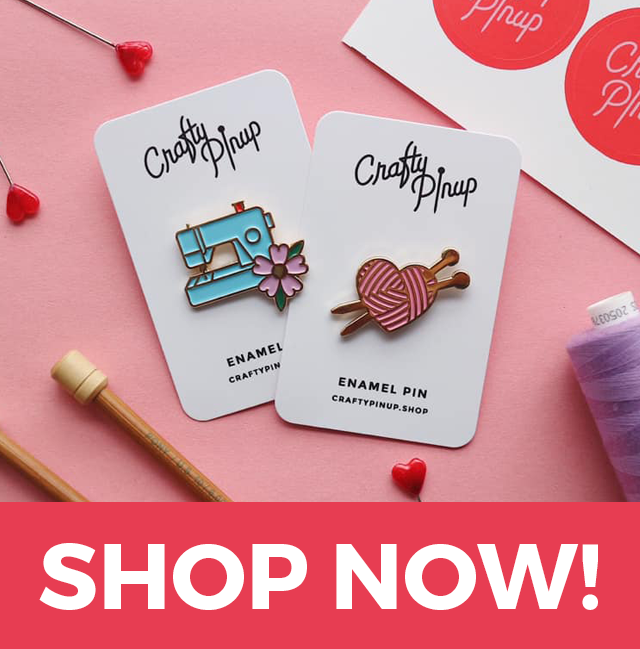 July included mainly vintage inspired makes featuring Sew Over It, Simplicity & supplies from Minerva Crafts. Thanks for reading & watching, pinups! 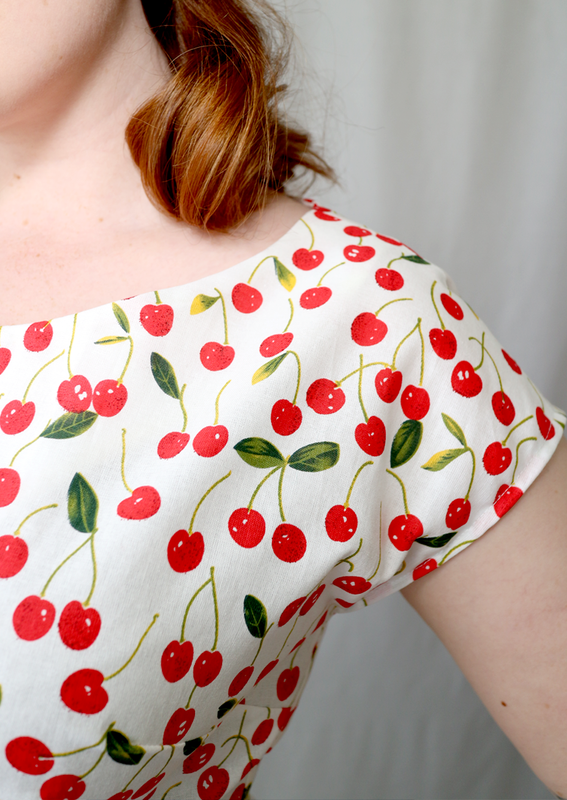 Simplicity 1940s 1590 - Cherry Top & GIVEAWAY! 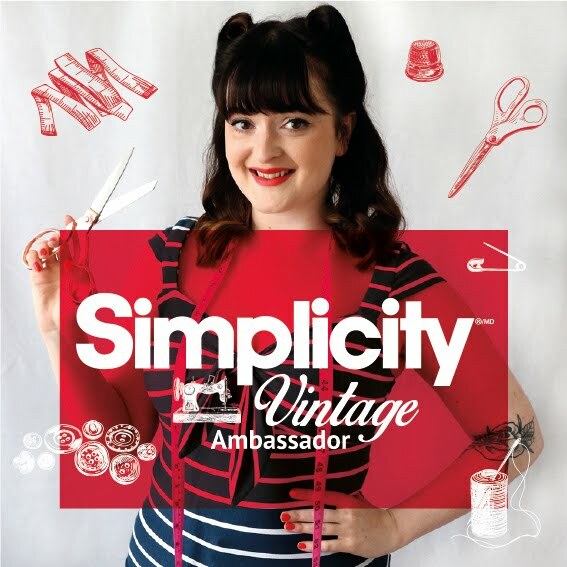 As part of my role of Simplicity's Vintage Ambassador I'll be giving my lovely followers a chance to win the vintage and retro patterns I sew too! 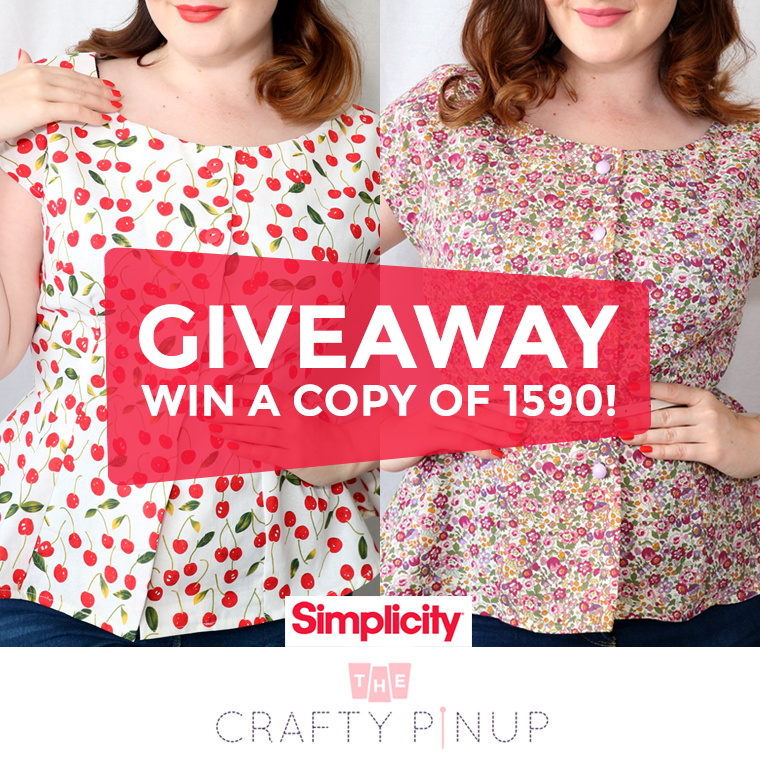 This time around Simplicity have generously offered 3 copies of the 1940s 1590 top pattern for me to giveaway! I decided to sew version A, the version without the tie or collar. 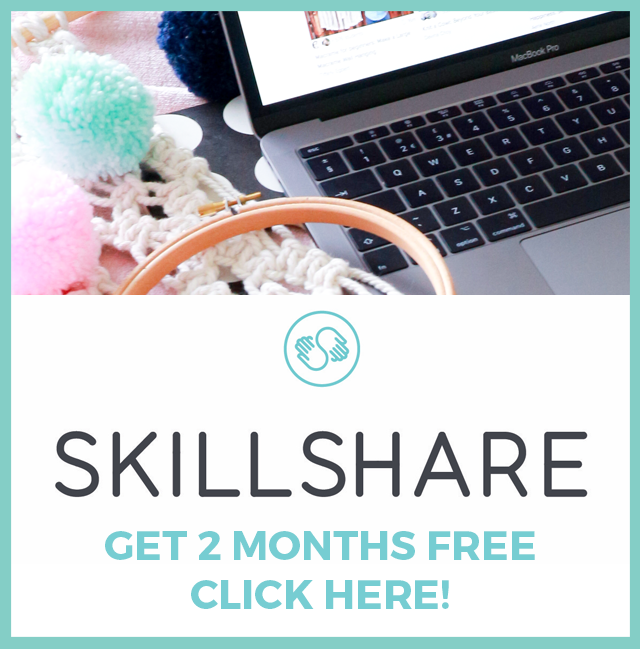 I'd recommend this pattern for beginners and beyond! 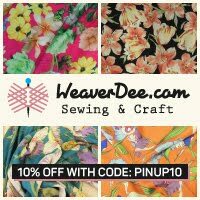 This top pattern contains some great skills to expand your sewing knowledge, like facings, button holes and darts. 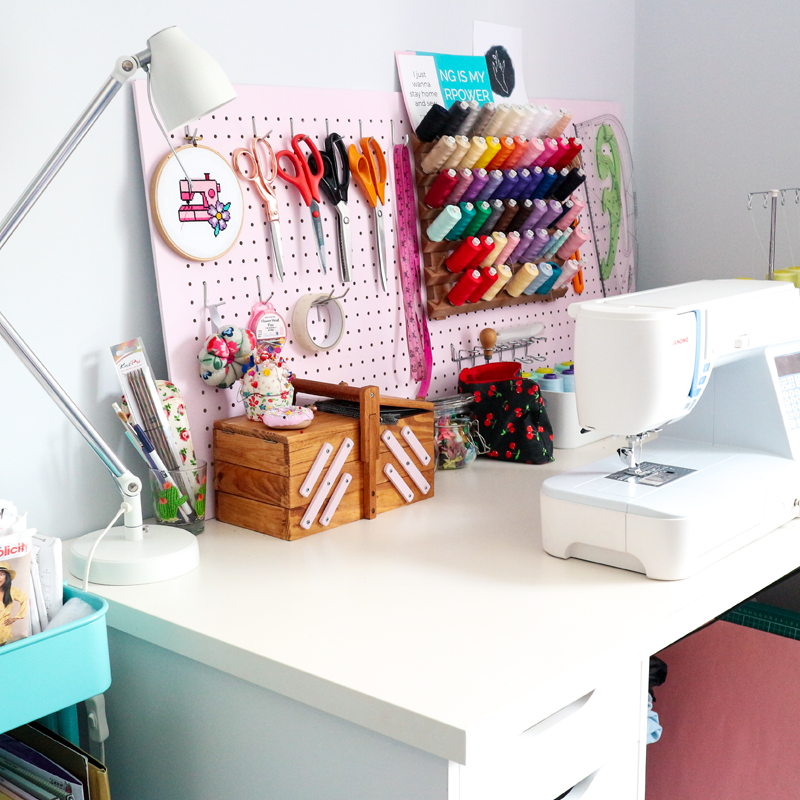 But if you're not sure, don't forget I filmed a handy 'Stitch by Stitch' sew along video to help you along the way! I'm really pleased with how my tops turned out. Especially as I made no adjustments to the pattern. They are the smart/casual tops my wardrobe needed! I especially love the super-simple sleeve, with no shoulder seam to sew, it's the easiest sleeve ever! - 3 winners will be selected at random on Friday 18th August and winners will be announced on my Instagram profile at 10am. Thank you so much to everyone who tuned in to my Stitch by Stitch 1590 sew along video so far, it's turned into my most viewed video on my channel! Please do enter my Instagram giveaway, and good luck! Disclaimer: This post is sponsored by Simplicity but all thoughts and opinions are my own. 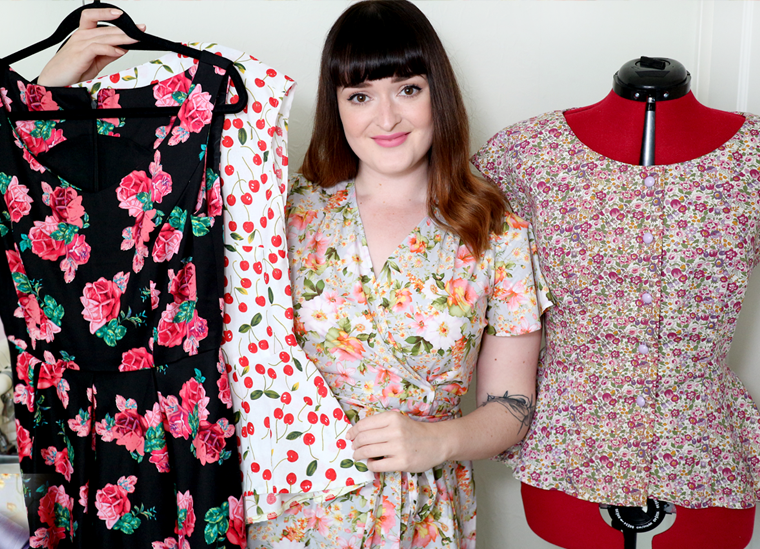 It's time for my next Stitch by Stitch video & pattern review blog post as Simplicity's Vintage Ambassador! After my struggles (and surprise) sewing the 1930s, I was super excited to start on my 1940s project. I feel much more at home in the 1940s as it's an era where pinup style was born and I can certainly see myself enjoying lots of the fashions. For my 1940s Stitch by Stitch episode, I chose the 1590 top pattern. 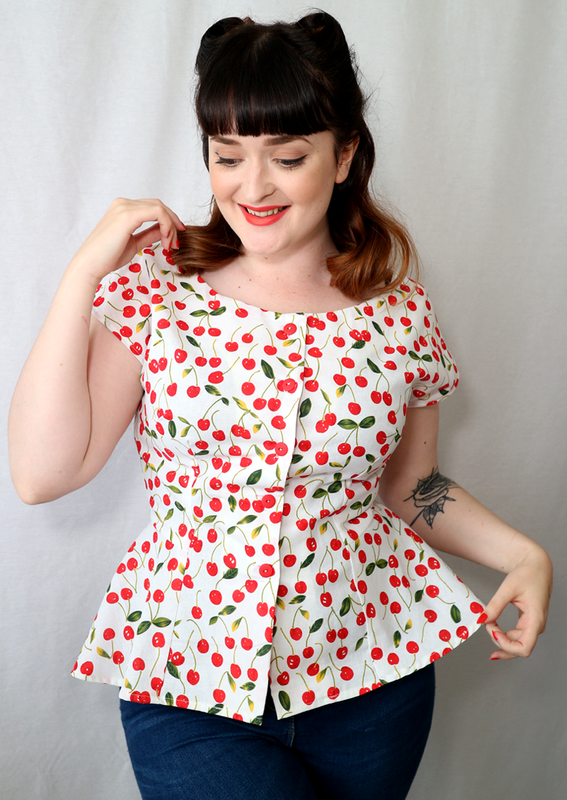 I chose this 1940s pattern rather than a dress as I've been eyeing this pattern up for a while and could really use some smart/casual blouses in my wardrobe to pair with jeans. I sew lots of dresses, so it certainly makes for a nice change! Of course this isn't your usual sewing pattern review... In the video below you'll be able to follow along with me as I sew my take on the 1590 top, along with a close up look discussing the fit and details, along with an in depth pattern review. If you have any questions about the blouse, please do leave a comment. I hope you find the video helpful and may even inspire someone to sew it! 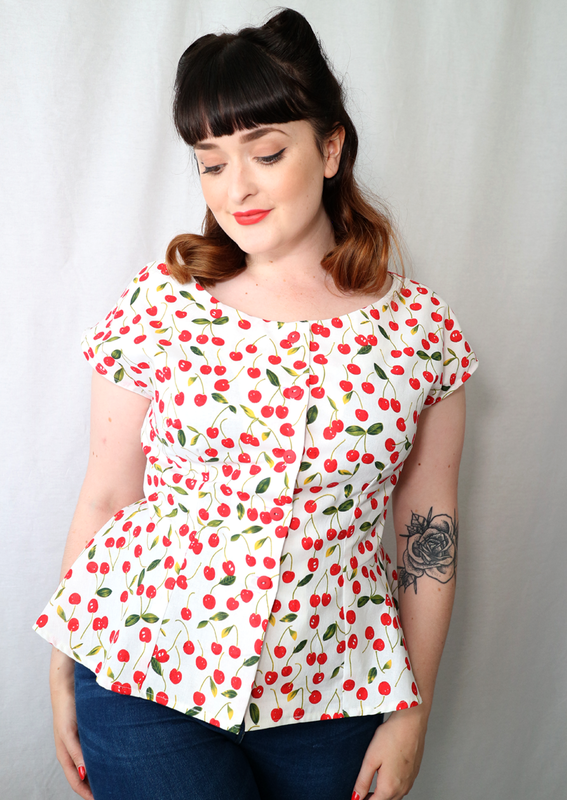 I was really pleased to hear (from helpful Instagram commenters) that the 1590 top was a straightforward and speedy sew - certainly my favourite things! And I'm pleased to say I too found this pattern a joy to sew. There isn't anything particularly challenging in the construction of the top and it's a great pattern to learn new skills like button holes, facings and fit. I really enjoyed sewing the 1590 pattern and couldn't be happier with the outcome. I'm pleasantly surprised with how well it fits considering my... ahem... sizable bust. I did no full bust adjustment to the pattern which I thought I might have to do (hence sewing 2 versions/wearable toile). It fits really well around my waist, with the great fitting bust and flared hips, this blouse has me feeling all Joan Holloway. Fabric: Cotton poplin from Birmingham Rag Market. Notions: 5 x 1/2 inch buttons. Sewing time: An hour and a half. Fit: Perfection! Weird I know. Difficulty: Easy-peasy! Beginners should definitely add this pattern to their wishlists! Watch out for: Clean finishing will make this simple garment look professional. Think neat button holes, under-stitched facing and beautiful hems. Make Again? : I already did! See my video above for a peek at my second cherry version. Coming to the blog soon. Overall, I'm really happy I got the chance to sew this 1940s blouse pattern. It's exactly what my wardrobe needed and I know I'll be getting a tonne of wear out of my two versions. I really hope you've enjoyed my 1940s Stitch by Stitch post and video as much as I have. 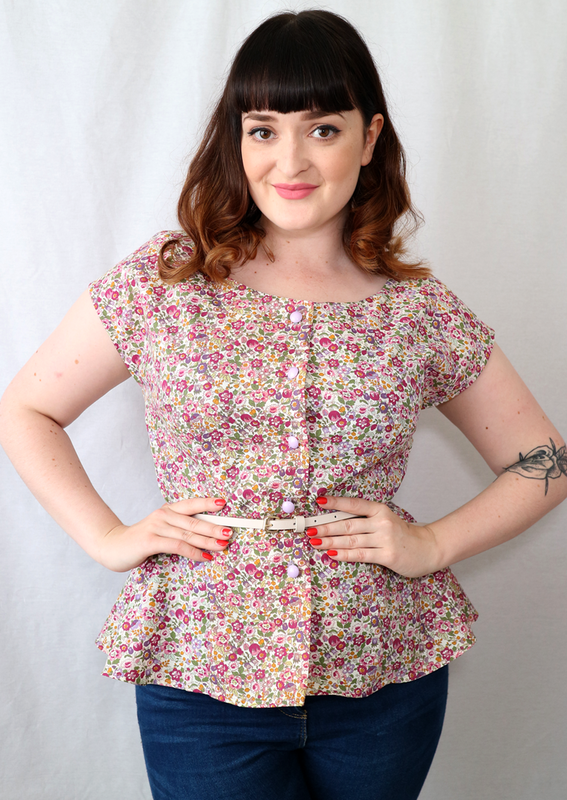 Will you be adding this gorgeous, simple blouse to their sewing list? 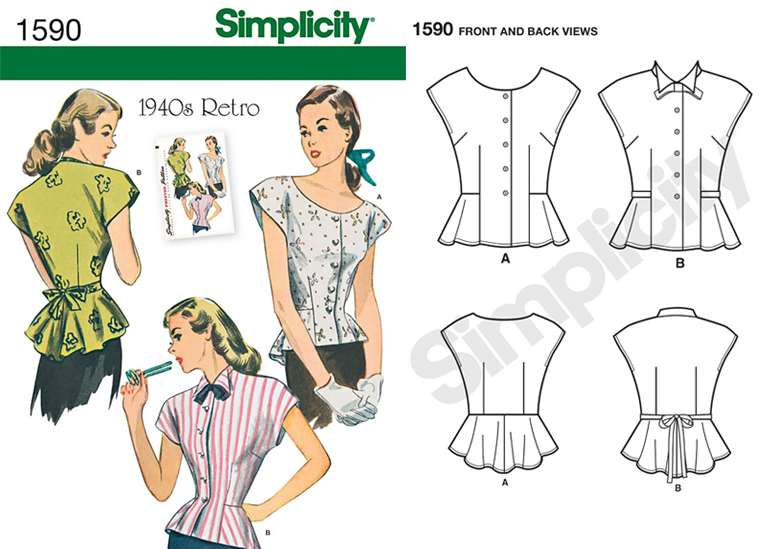 - 1950s: Simplicity 8342 - Rockabilly Tie Front Top + Sew Along! - 1930s: Simplicity 8247 - Sewing the 1930s (eeek!) + Sew Along Video!